Esquilino is one of the central neighborhoods of Rome. It includes Termini station and piazza Vittorio Emanuele. Many tourists pick b&b’s and hotels in this neighborhood for its central position. The neighborhood is very congested with cars and people. It features beautiful buildings such as Santa Maria Maggiore’s basilica. Great position. Due to Esquilino’s position, public transportation allows you to reach quickly both the historical downtown and other points of interest located in every part of Rome. Santa Maria Maggiore’s basilica. Don’t miss out on the chance to visit the papal Church dedicated to the Holy Mary that features magnificent works of art. If you happen to be in Rome on august 5th you may want to stop by to witness the commemoration of the miracle of the snow that fell in 358 a.c.. According to the legend, Pope Liberio had a dream of the Holy Mary that told him to build a Church dedicated to Her. Chiesa di San Pietro in Vincoli. 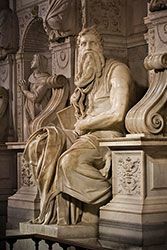 There are at least two good reasons to visit the Church of Piazza San Pietro in Vincoli: the Michelangelo’s Moses and the chains that held St. Peter while he was imprisoned at Mamertino prison..
Museo Nazionale romano. Whoever visits Rome usually tends to underestimate the Museo nazionale romano (Roman National museum) that features a long list of sculptures, II century greek bronzes, precious frescos from 10 b.c., coins and jewels, and Grottarossa’s mummy.. The cumulative ticket includes also Palazzo Massimo, Palazzo Altemps, Crypta Balbi and Terme di Diocleziano. Security. According to a poll by Censis institute of research from May 2015, Romans selected Esquilino as the least safe neighborhood of the city. 13.8& of the population thought so. In the neighborohood 67.5% selected Termini station as the most dangerous spot. 20.4% picked Piazza Vittorio. 18.6% picked Tiburtina station and 11.7% Ostiense station.. Despite its reputation, we romans like to hang out in this neighborhood for many reasons such as the art spots, good ice cream, ethnic food and many other reasons. Ice Cream. 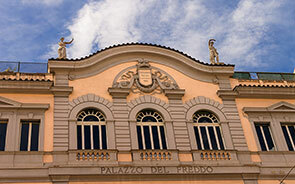 Generations of Romans have been to the Palazzo del Freddo (Cold Palace) for ice cream. Located in in via Principe Eugenio 65 it’s been there since 1928 courtesy of Giovanni Fassi, the founder. Besides the regular cones and cups, you can try the “sanpietrino”, a cake whose shape resembles the classic cobblestone that it’s used to pave many Rome’s roads. It’s a a square-shaped cake made with custard, zabaglione, chocolate, coffee or nuts, covered with a chocolate glaze..
Sicilian Pastry. Even though it’s not really a roman tradition, it’s worth to try the sicilian cannoli with ricotta cheese at Dagnino Pastry in Galleria Esedra, Via V. Emanuele Orlando 75. You can also try the cassata, brioche with ricotta cheese or ice cream, and the arancini. The place is a little pricey but, since you can eat while standing or have it to go, it’s worth to pay a visit. On the go. Rione Esquilino has a lot to offer to whoever visits Rome and likes to eat on the go. High up in the bakery charts is Panella, located in Via Merulana 54. The place offers an enormous choice of bread, pizza, and sweets. Over the last few years Panella has offered great aperitivi (happy hour) becoming now a must for evening walks. Go there between 6:30 pm and 10 pm for extravagant foods. A solid alternative is Pietro Roscioli’s bakery, great choice as traditional bakery as well as cafeteria..Bread, squared pizza, and pasta are the specialties of the house. Finally, in Via Firenze there’s the Antico Forno Firenze that makes great sandwiches with veggies, meat, coldcuts, cheese and whatever you like. It also bakes pizza, sweets and other baked delicatessen. Ethnic market. Esquilino is the international borough of Rome, a sort of roman chinatown with a multicultural spin to it. Near Piazza Vittorio Emanuele from Monday to Saturdays you will find the covered local market, divided in two parts: one for foods, the other for clothing and textiles. From 7 am to 2 pm you can purchase foods and spices from all over the world: China, India, Bangladesh, Senegal, Romania. The stands are in the ex barracks Sani. You can access from Via Principe Amedeo or via Mamiani or via Turati or via Lamarmora. If your hotel is nearby, it’s worth to pay a visit. Art exhibits. The Palazzo delle Esposizioni, in via Nazionale 194, hosts interesting exhibits, film festivals, concerts and art workshops. Spread out on three floors, a total area of 10 thousand squared meters, it features a movie theater, areas for children, a cafeteria and a bookstore. From Monday to Friday the restaurant with the glass ceiling, serves a buffet lunch for 16 Euros. Opera. Close to Termini station there’s the Teatro dell’Opera di Roma, opened in 1880 and dedicated to opera and balet. The venue is also known as Teatro Costanzi,named after its creator Domenico Costanzi. If you wish to attend a show, we recommend you to purchase your ticket way ahead..
Theatre. For theatre lovers, located in Via Guglielmo Pepe 45 there’s the Ambra Jovinelli. Opened in 1909, it hosts mostly comedies nowadays. All the roads take you to Termini Station. Even though Tiburtina station is becoming more and more importan, Termini Station remains a landmark for most romans.. Subway and bus. You can get there with both the A line and B line and with many buses that run from Piazza dei Cinquecento. Fiumicino. A city train connects it to Fiumicino Airport. Ciampino. Private buses connect it to Ciampino Airport.